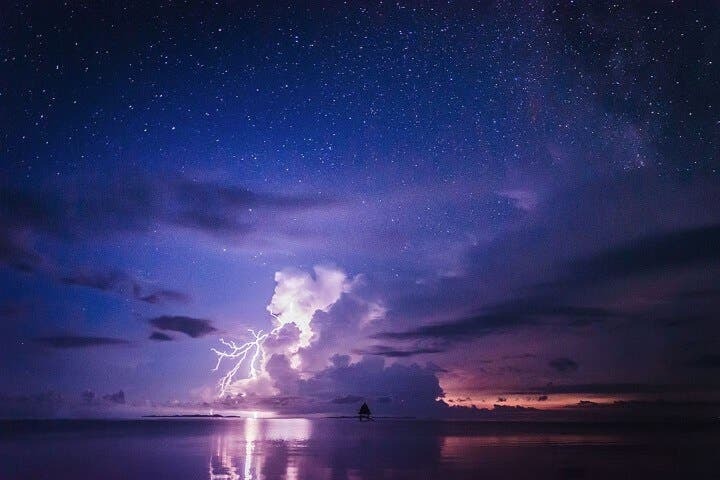 Dutch photographer Martien Janssen took his chance and was prepared when he was faced with a seemingly impossible opportunity to photograph the Milky Way and lightning over our very own Siargao Island, Philippines. Janssen, the photographer behind the social media page Travel Imagez, fell in love with the Island of Siargao in the southeast of Philippines that his original plan to stay two weeks eventually stretched to 10 months. During that time, while traveling in and out of Siargao, he created stunning photos and time lapses of the island and other Philippine destinations. After some of his Siargao Milky Way time lapses went viral, he got invited at the popular Dedon Island Resort in Siargao Island to shoot a time lapse movie for the exclusive luxury resort. The unexpected happened in one of the nights he was shooting. The Milky Way was in the right position, and it would have been the perfect clear night to shoot it, when suddenly a big storm appeared with bolts of lightning right where the Milky Way was. Disappointed as he was at first, he faced the challenge–shooting the Milky Way and the lightning at the same time with several cameras. Photographers know how difficult it is to shoot the Milky Way and lightning especially to frame them both at the same time (it’s nearly impossible); even more so in a multi hour time lapse. Photographers know how difficult it is to shoot the Milky Way and lightning especially to frame them both at the same time (it’s nearly impossible), but even more so in a multi hour time lapse. But he did it. Armed with four cameras, configured in different settings, he was able to capture the almost impossible in four-time lapse scenes shot at the same time. Not only that, he even captured rare red sprites. Weather geeks will know this, but for many of us that don’t: red sprites are huge electrical discharges above thunderstorms. Some photographers have spent years trying to photograph this rare occurrence to no avail. Since clouds always accompany storms, you can imagine it’s hard to shoot what occurs above the clouds. The faint light of red sprites requires very light sensitive equipment as well, so altogether it’s extremely challenging. To capture with the Milky Way and a lightning storm at the same time, is possibly a first time-ever achievement. Indeed he was lucky, but as in all opportunities, he was prepared. He calls this creation one of his best. The video ‘The Perfect Storm’ has gained hundreds of thousands of views and has since been featured and shared across the web. More about how he captured this amazing time lapse in his blog post The Perfect Storm. Find out more about Martien Janssen and his photography trip around the world on his travel photography website www.travelimagez.com. See more of his incredible time lapse movies and drone videos at his YouTube channel www.youtube.com/c/travelimagez.